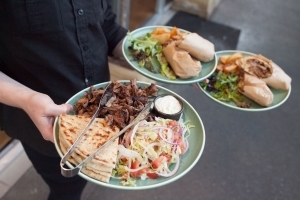 Since 2002, The Greek has been recognised Australia-wide for delicious and creative Greek cuisine. We offer an unparalleled dining experience for locals and visitors to Adelaide. Behind our heritage-listed chimney & facade you’ll find the best restaurant in Adelaide for relaxed dining, celebrations and business lunches. 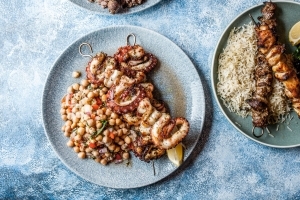 Our exceptional food, wine list and service have helped the restaurant win The Lifestyle Food Channel’s Favourite Greek/Mediterranean Restaurant a number of times. During warmer months, The Greek is Adelaide’s best restaurant for alfresco dining with tables on the tree-lined street enjoying the vibrancy of its city location. Our restaurant wine list features the best of South Australian wine and is a favorite of connoisseurs. Many of our patrons frequent the restaurant for relaxing afternoons or pre-dinner drinks. The Greek is open from 10.30am weekdays and 11:30am on weekends. Open lunch & dinner 7 days a week. Bookings can be made in person, over the phone or via our booking form.